True tea connoisseurs have no doubt heard about cast iron teapots. Japanese cast iron teapots, called tetsubin or sometimes tetsukyusu, are a traditional part of the Japanese tea ceremony. You can find tetsubin in a variety of beautiful traditional Japanese designs, from pebbled surfaces to beautifully cast dragonflies or cherry blossoms. Why use a tetsubin? Beyond the beauty and history surrounding these teapots, they make wonderful vessels for brewing tea. They’re sturdy and hold heat very well. The teapot lends some of its iron to really enhance the flavor of any tea. In this guide, we will review the best cast iron teapots by looking at the style, materials, accessories, and benefits of each. Then I’ll address some common questions about Japanese cast iron teapots before giving you my final recommendation. Are Cast Iron Teapots Safe? Can You Put A Cast Iron Teapot On The Stove? Are There Any Cast Iron Teapot Benefits? How Do You Care For A Cast Iron Teapot? 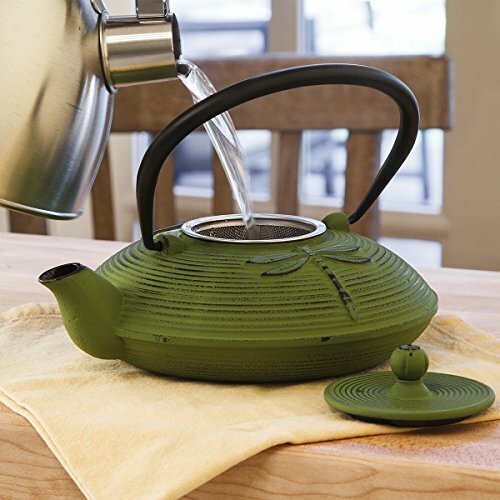 This teapot is made in the traditional Japanese style and has the time-honored pebbled pattern on the pot itself. The lid features plum blossom, pine needles and bamboo, which symbolize noble character and loyal friendship. While this pot states that it can hold 22-oz, it realistically holds about 15 or 16-oz without spilling water from the spout. You can use this teapot on the stove, although this is risky, since it’s designed for steeping different types of tea, not boiling. That’s why it comes with the mesh filter basket, which makes loose leaf tea less of a chore to brew. The enameled interior is great for clean-up and preventing rust, but it also prevents iron from leaching into the tea. You’ll still notice a great flavor from this solid teapot, albeit without the rust and purported cast iron health benefits. This black and gold teapot is made in Japan. The outer design features koi, which are the Japanese symbol for love and affection. It also features Japanese writing and a wave design on the lid. The shape of this teapot is unique – it is shorter and shallower than the traditional, Western teapot design. This is a larger tetsubin, holding up to 37-oz of water. Since the spout is wider and slightly taller, you will get less splashing when you boil on the stovetop. Like most tetsubin, this is designed to be more of a steeping vessel. You should add your tea to the included stainless steel basket before pouring your boiling water into the teapot to brew. The interior is fully enameled, which adds protection and ease of use. 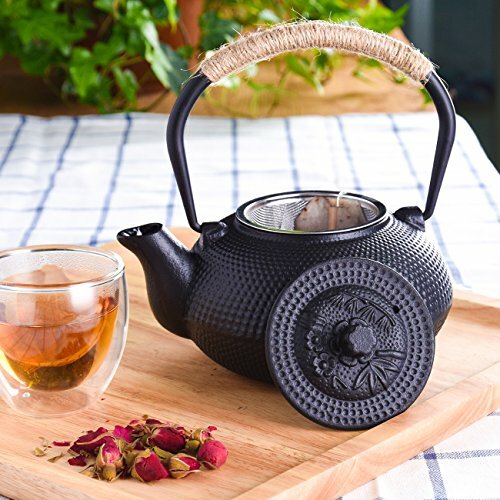 This teapot is available in a variety of different Japanese colors and designs, from flowers and warriors to trees and pebbles. The rope is an artistic touch, but only does a mediocre job at keeping your hand from being burned. This is a smaller tea kettle. I call it a kettle because this pot is designed to be heated, rather than just used to steep tea in. It’s safe to use over medium to low heat, and the included fine mesh basket helps ensure that even the smallest ground teas are contained such as matcha. It holds 27-ounces if full to the brim, or about 22-ounces if you are going to boil it. The interior of this tea kettle is an infused enamel, which is much different than the high-gloss enamel that other pots use. This feels like more of an unlined tea kettle. The jade dragonfly design of this tetsubin symbolizes new beginnings and good fortune. It’s lovely that the handle folds, making it easier to get the mesh basket in and out. However, the handle and lid both get very, very hot. This teapot is more for show than daily tea brewing. It should not be heated on the stovetop and should instead just steep tea and keep it very warm. It does hold heat for a long time, and makes tea with good flavor. The mesh strainer basket goes near to the bottom of the pot, so it will steep tea with very little water if only making a cup or two. The enamel inside isn’t very nice. It has the tendency to flake and chip, posing a health risk to the user. 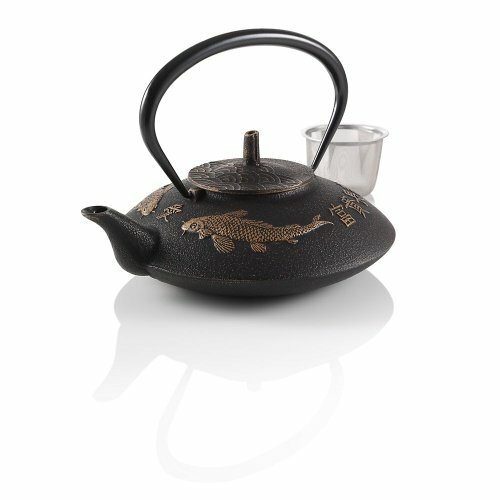 This is a gorgeous tetsubin, but not user friendly to the daily tea drinker. You can purchase this set in a variety of different designs. This is almost the exact same teapot as the JUEQI Japanese Cast Iron Teapot reviewed above. You can purchase the same traditional Japanese designs, and this set comes with the trivet already included for just a few dollars more. Like the JUEQI, this teapot is small, holding just over 30-ounces. It uses the included mesh strainer to brew tasty tea. Since the inside is unfinished, it releases that health-boosting ferrous oxide (iron) into the water. This creates a strong and unique flavor for each cup of tea. The lid has vents, which is nice for preventing boil overs, and this can be used on the stovetop over low heat. The shape of the spout helps prevent spills and drips and the included trivet helps protect your tabletop more thoroughly and stylishly than a potholder could. 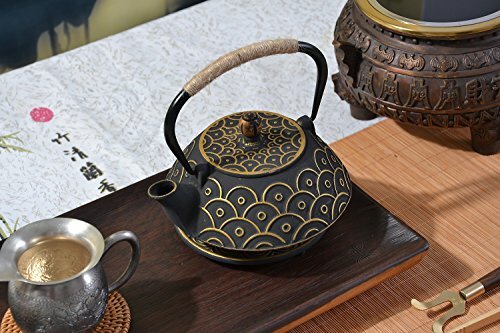 This traditional cast iron tea set is made in China in a Japanese style. It features a sort of scattered pine needle design, which the manufacturer compares to dragonflies – these are a traditional symbol of joy, happiness and strength. The tea cups are crafted in a matching style. This is not for stovetop use. This set, which comes with a mesh strainer basket for brewing, is designed to brew your tea and keep it warm. The included cups are reminiscent of the Japanese tea ceremony, making it a great choice for a couple or for using with company. The interior is finished with a black enamel to help prevent rusting and aging. Not enough iron will be allowed through that coating to allow true health benefits. Japanese cherry blossoms have festivals dedicated to them each spring to celebrate the beauty of life. That’s why the Japanese manufacturer behind this teapot included them in the classic design. The outer cast iron is coated in a rich, plum purple with golden flowers. It’s a striking teapot when compared to other, non-colored ones. You can use this on the stove top. It isn’t designed for that purpose, but it will work. You may get some discoloration after a period of exposure to direct heat. The mesh on the included strainer basket is very fine, so you can brew loose leaf (or bagged) tea. The interior is coated with a porcelain enamel to prevent rusting. It also makes clean-up a breeze. The quality of this craftsman-made tetsubin is evident in the sheer weight and long-lasting paint/enamel. Cast iron pots are 100% safe to use. They do give off a small amount of carbon and iron, but the amounts are so minimal that it poses no health concern. The enamel coating inside the teapots can be an issue if it begins to flake into beverages, as it may contain harmful chemicals that should not be ingested. Depends on which one you purchase. Nearly all tetsubin are created for steeping/brewing tea, not for boiling the water like a tea kettle. 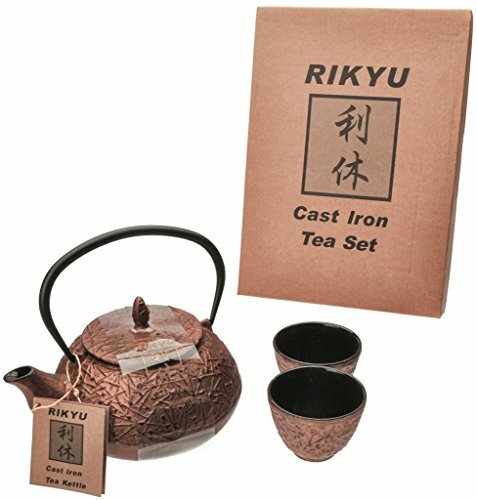 Some tetsukyusu, which get mistaken for tetsubin, are actual tea kettles designed for boiling water. Check the requirements for your particular teapot. Cast iron has been around for so long because it has amazing benefits. You’ll want to brew a batch of tea to season the teapot before using. This helps prepare the pot and gets rid of any odor from the enamel coating. After each use, there’s no need to wash or scrub the inside. Just pour out any remaining tea/water and remove the lid to let all liquid evaporate. In fact, extra tea can be used to care for the outside of the tetsubin, as it works like a natural polish. All tetsubin are beautiful and fun to use. 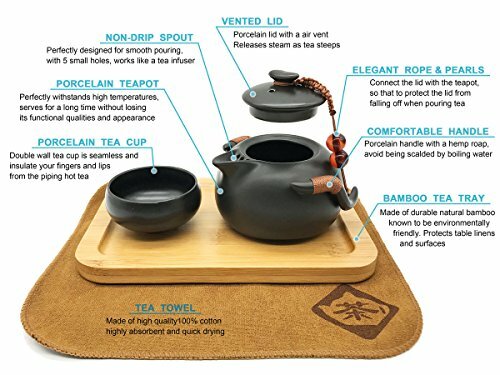 Based on quality alone, I would recommend the Iwachu Japanese Iron Tetsubin Teapot. 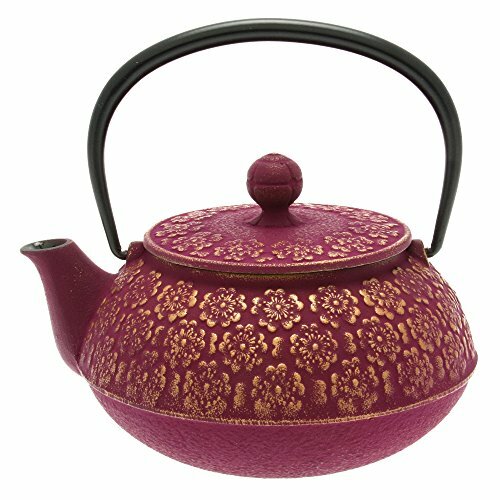 It’s made in Japan by craftsmen who have been creating cast iron teapots for ages. While it is attractive, I feel that the quality and level of detail in Japanese made teapots trumps their Chinese-produced competition. It’s a traditional tetsubin in every sense of the word and may be worth the extra money.